Well before the development of today’s innovative technologies supporting this simultaneous gravitational-wave and optical observation, early research in numerical relativity at the University of Illinois at Urbana-Champaign helped to lay the theoretical foundation for it. In fact, many features of the discovery had been predicted in the early computational simulations of Professor of Physics and Astronomy Stuart Shapiro and his group. "This discovery of merging binary neutron stars with counterpart electromagnetic radiation is particularly rewarding to me and to my University of Illinois colleagues. It means that some of the cosmic phenomena that we have been studying and simulating on supercomputers for many years actually occurs in nature, much in the way we predicted," Shapiro comments. When Shapiro joined the faculty at Illinois in 1996, bringing with him his then-postdoc Thomas Baumgarte, Shapiro was immediately invited to join NCSA as a research scientist by then-Director Larry Smarr. 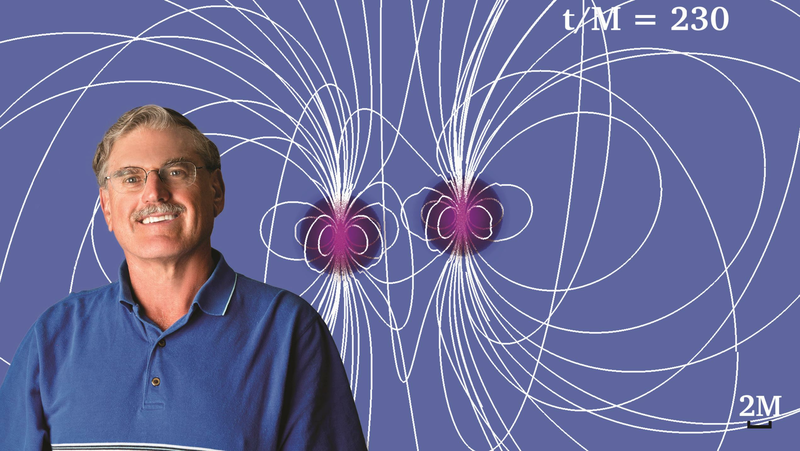 “Physics Illinois was a hotbed of research on the properties of neutron stars, and NCSA was a leading center for numerical relativity,” remembers Shapiro. At that time, Shapiro was already an established expert in the physics of compact objects—including black holes, neutron stars, and white dwarfs—and was a co-developer of one of the very first computer codes that could calculate the structure of a spinning neutron star according to Einstein’s theory of general relativity. With Baumgarte and several other collaborators, Shapiro was also one of the builders of the first code in general relativity that modeled binary neutron stars moving in a close circular orbit about each other. In 1999, using the computer tools they’d devised, Shapiro and Baumgarte, along with another postdoc in the group, Masaru Shibata, constructed models of a single rotating neutron star with mass greatly exceeding the maximum mass of a non-spinning neutron star. They proposed that such a star was a possible short-lived remnant of a binary neutron star merger and coined the name “hypermassive neutron star” for this transient object. Their model suggested that it would be stable over many rotation periods, but predicted it would eventually collapse to form a spinning black hole. The team predicted this delayed collapse would be attributable to gravitational radiation loss, turbulent viscosity, and/or internal magnetic fields, which would radiate away or transport outwards angular momentum (spin), the hypermassive neutron star’s principal source of support against gravitational collapse. But solving Einstein's equations of general relativity to simulate the full evolution of a binary neutron star, beginning with a binary in circular orbit and through its late inspiral, merger, and eventual collapse, was proving to be quite a challenge for numerical relativists. The same was true for the inspiral and merger of binary black holes. So in 2000, Baumgarte and Shapiro, building on earlier work by Shibata and his graduate advisor Takashi Nakamura, both of Kyoto University, designed a new, robust numerical algorithm that enabled simulations of the inspiral and merger of these compact binary stars to be performed in a stable fashion according to general relativity. The scheme they designed is now referred to as the Baumgarte-Shapiro-Shibata-Nakamura (BSSN) numerical relativity scheme and is the most widely implemented approach to solving Einstein's equations on a supercomputer. Shapiro and his group spent part of the next several years studying exactly how a hypermassive neutron star eventually collapses to a spinning black hole, finding in 2006 that the black hole typically becomes embedded in a low-mass disk of magnetized gas of neutron-star tidal debris that accretes slowly onto the black hole. “Such an identification had been hypothesized by theorists, but a firm indication that this might be possible in general relativity was still lacking,” he recounts. Shapiro and his group spent the next several years simulating the merger of binary neutron stars and binary black hole-neutron stars with magnetized neutron stars and spinning black holes, becoming one of the very few groups worldwide capable of simulating such an event according to the laws of general relativistic magnetohydrodynamics. The key breakthrough came in 2015 when Shapiro and his postdocs Vasilis Paschalidis and Milton Ruiz were able to evolve a magnetized binary black hole-neutron star from its late inspiral, through tidal disruption of the neutron star and merger, to the formation of a magnetized gaseous disk orbiting the remnant black hole. They found that in addition to the burst of gravitational waves emitted during this event, a jet of plasma was eventually launched above the poles of the black hole, and this jet also shot a collimated beam of electromagnetic radiation outward into space. “Such a jet, confined by the walls of a tightly wound, twisted, helical magnetic field—picture field lines twisted as in a barber-pole—above the black hole poles, was long believed to be a crucial ingredient in generating a short gamma-ray burst. The jet produced in our simulations had the expected duration and typical luminosity of observed short gamma-ray bursts. This finding was a real first and generated a lot of excitement in the field,” Shapiro comments. Next the group simulated the merger of magnetized binary neutron stars and, in 2016, reported that those systems that formed a transient hypermassive neutron star following merger and then underwent delayed collapse to a black hole also produced a jet. Most recently, in 2017, the team performed simulations for more massive neutron star binaries that had a total mass above a critical threshold that forced them to undergo prompt collapse following merger. According to Shapiro, details of the discovery announced today will dictate many further questions and future simulations. Shapiro and his U of I group hope to continue to play a significant role in this very exciting and ongoing scientific investigation. Stuart Shapiro's research has been funded by NASA and by the National Science Foundation.